During this National Week of Making extravaganza, let’s take a moment to celebrate the sillier side of tinkering, and indulge in remembering some of the less practical and most fun projects that have come out of the Tinkering Studio. But first, a slightly more serious note. Tinkering is a highly engaging form of making and thinking with your hands, it encourages people to pose their own goals and define success for themselves, but at the same time it can put learners in a vulnerable position, that of not knowing: the right answer, the next step, whether they’re doing it right. It is important that we create an emotionally safe and personally friendly space to allow visitors to navigate those feelings. 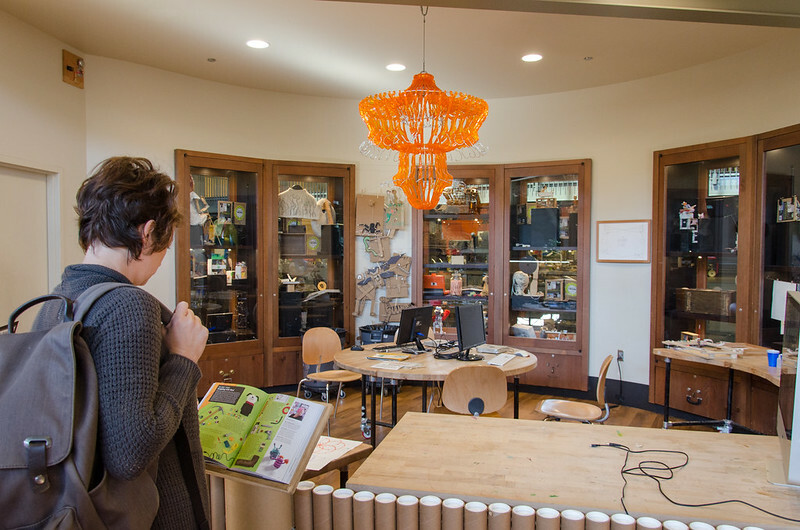 One shortcut to connect with learners at an emotional level is through considered use of humor and whimsy, which are always present in Tinkering Studio offerings in one way or another. We enjoy unusual juxtapositions of topics, like sewing with circuits or using familiar materials in unfamiliar ways, and use humor to lower the barriers for entry for those who might approach the activities more tentatively. Playful and whimsical aspects of activities set a tone for what we value beyond "capital S" Science, and hint that these tinkering experience might embrace more than traditional didactic science learning. They are a way of presenting ourselves as fully rounded human beings, rather than idealized “experts,” but they also encourage visitors to feel that we will accept all aspects of them, including the silly and fun ideas they might have. We often refer to this quality of our work as “snarkasm,” a term that suggests perhaps a more cutting tone than we intend. It originated in the occasion of the 2011 ASTC conference, the first time we really presented our work to a large and important audience of our professional peers, creating the first Cabinet of Curiosities which collected artifacts and artwork created over the course of the last few years. Perhaps recognizing that at first glance a lot of these objects might seem silly, frivolous, or pointless, we reacted by embracing and reclaiming our point of view with humorous “toe tags” describing each item in funny ways. I wrote approximately 50 snarky descriptions for things that we loved for one reason or another. Unfortunately my documentation skills failed me at the time and I did not take any clear photos of the toe tags in action, so I will just have to recreate some of my favorites. 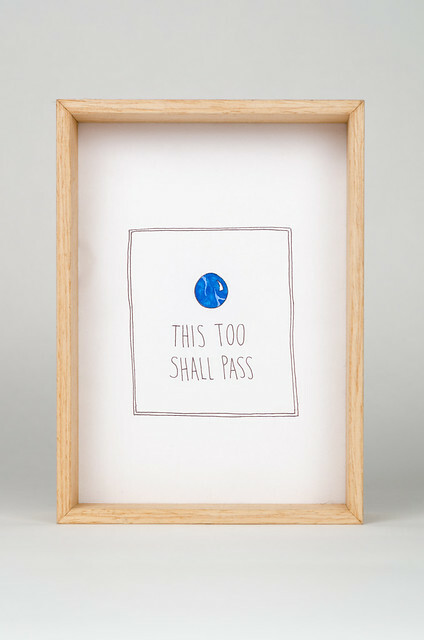 You get the idea… it’s about having a perspective on your own work that allows you to take the work as seriously as possible, while still not taking yourself all that seriously, staying open and delighted by the strange and idiosyncratically quirky places the work takes you, and celebrating the awkward. In fact, we have a long running series of blog posts titled “tinkering moment of zen” that try to capture just that. Sometimes it’s Tim Hunkin eating a self-portrait carved into a banana. Sometimes it’s Scott Weaver juggling frisbees into the toothpick sculpture that took him 35 years to build. More often it’s funny little moments that are part of this strange job, like an ironic juxtaposition in the elevator, or an impromptu bit of pumpkin juggling (what’s with all the juggling, anyway? ), that time when Nicole decided to cut a cake with a jigsaw, or the wimpiest pushup competition ever (Lianna totally won). But more often we express humor and whimsy directly in the artifacts and details that we create and share with our visitors. 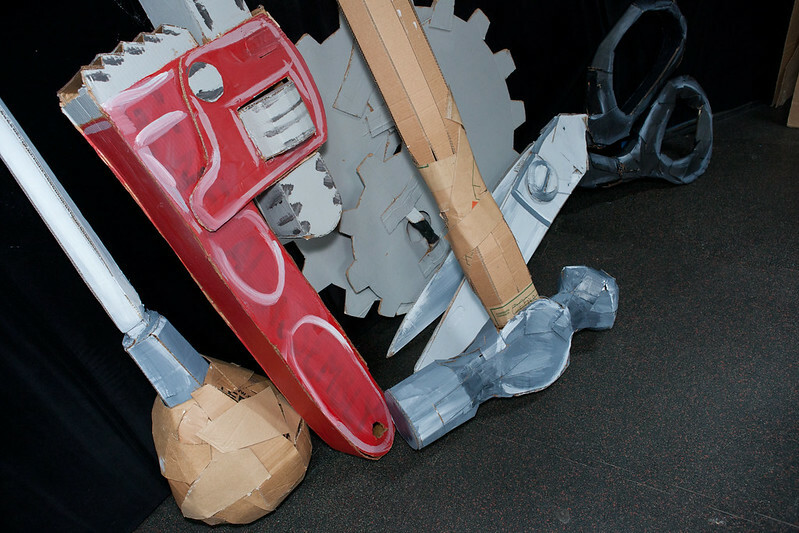 These are objects that permeate the Tinkering Studio environment, usually without a sign with a description or explanation (unless they are a sign, in which case they are their own sign). They reward visitors’ curiosity, exploration, and sometimes low stature. Here are some of the highlights over the past few years! 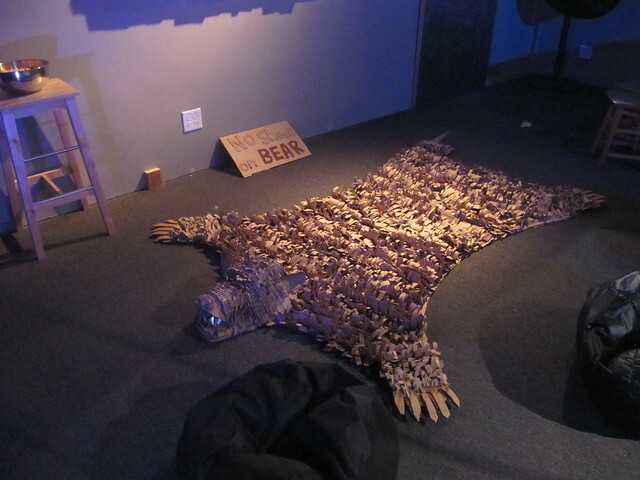 A bearskin rug made of cardboard, created to complement a cardboard fireplace frame for a monitor. As you do. 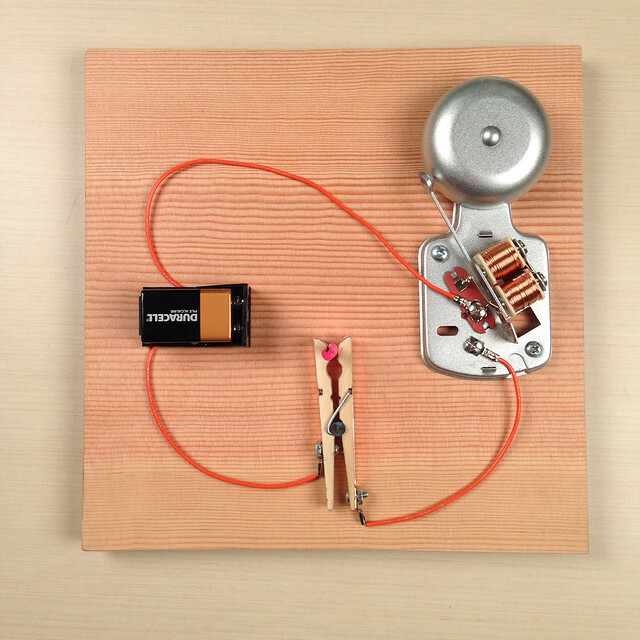 A “fire alarm,” inspired by the circuitry work of Forrest M. Mims III, which hangs in the Tinkering Studio right next to the actual fire alarm. My dog Pepper comes to work with me sometimes, and she likes to sit by the large glass doors that face the exhibit hall. Often kids (and adults) try to interact with her through the glass, it almost feels like she’s one of the exhibits. So I made her a label. Finally, here is a little treat for the shorter visitors: all the drawers’ handles make little faces. Of all the “easter eggs” hidden in the Tinkering Studio, this is perhaps the one that is noticed by the fewest people.